Huang Bo and his unexpected pal in Cow. The Skinny: Unglamorous title aside, Cow is an accomplished and unexpected film about one man, one cow and a chaotic world at war. Featuring an award-winning performance from the world's most unlikely leading man, Huang Bo. by Kozo: Cow’s unique premise promises something special, but the film delivers far more thanks to director Guan Hu’s superlative execution. The Golden Horse Awards apparently felt the same, because they nominated Cow for seven(!) awards, including Best Picture, Best Director, and Best Actor. The film won for the latter, with increasingly popular though still questionably attractive Huang Bo taking home his first Golden Horse trophy in a tie with Nick Cheung (Beast Stalker). 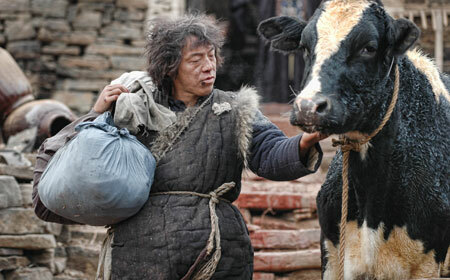 Huang stars as Niu Er, a cow farmer during the Second Sino-Japanese War who returns home to find his entire village wiped out by Japanese soldiers. The only remaining survivor: the village's prized Dutch milk cow who survived because she was hidden by the villagers, who didn’t want anyone swiping her. Now alone in the abandoned village, Niu Er and the cow are stuck together – though perhaps Niu Er wishes otherwise. When a group of injured Japanese soldiers happens upon the village, Niu Er has his opportunity to leave the cow behind. However, he pauses, with the reasons why only gleamed through copious flashbacks and an understanding of Niu Er's unique character. We learn that Niu Er became the cow's reluctant guardian, receiving the duty from the town while also getting a surprise boon: marriage to Jiu Er (Yan Ni), a sassy widow whom Niu Er previously admired from afar. The flashbacks reveal Niu Er and Jiu Er’s courtship while also clueing us in on the cow's importance. Besides being prettier than your usual Chinese cow, the Dutch cow can provide much more milk, making her indispensible for supplies-starved refugees or soldiers. For Niu Er, however, the cow could mean much more; in some ways, she's a symbol of Niu Er's love for his new wife. Ultimately, the cow could prove to be Niu Er's friend - and it's only after some harrowing and even unbelievable events that Niu Er discovers that for himself. Cow has a simple premise, but Guan Hu develops it smartly, changing the film in unexpected and compelling ways. The film starts tragically, with Niu Er's discovery of his dead neighbors and friends shown in disturbing, even grotesque detail. Active, exaggerated camera movement and editing characterizes these first scenes, but the dizzying direction helps to bring us into Niu Er’s grief-stricken, shocked state. The same exaggerated tone continues throughout the film, taking the form of pronounced performances, black humor, and action set pieces that sometimes seem straight out of Die Hard. Huang Bo’s performance is also exaggerated, both emotionally and physically. Guan Hu renders his characters as broad archetypes rather than fleshed out, complex beings. The cow even has a personality; hell, it can even cry! This is all obviously unrealistic, but this lack of realism comes with a purpose. By walking the tightrope between fantasy and reality, Guan allows the film a power that a verbal statement of theme might not match. The film could be described as belonging to the genre of magical realism, which uses the fantastic in otherwise realistic trappings to explore its themes and ideas. Here, the use of comedy and fantasy keeps the audience’s eye on the content rather than its destination, resulting in unexpected and effective shifts in theme and emotion. On one level, Cow obviously criticizes the Japanese army for their cruel slaughter of everyone in Niu Er’s town. However, before long the film expands its critical eye, showing that war can make monsters out of just about anybody. At the same time, Niu Er’s humanity and decency are drawn out marvelously by the circumstances he faces. Guan Hu’s ideas and themes develop organically from his situations and characters, making them much more effective cinematically. Grounding everything is Huang Bo’s performance. There are few actors who could essay such a homely, obtuse, yet genuinely identifiable character as Niu Er. Huang is a rare performer – a comic actor who can overact and mug onscreen, and yet still possesses emotional depth an ability to convince. Not all his projects showcase him well (Fit Lover is a prime example), but Huang Bo is genuinely talented. Trying to imagine one of China’s other not-so-pretty actors as Niu Er seems impossible after seeing Huang Bo in the role.